There is a growing recognition among water resource managers that sustainable watershed management needs to not only account for the diverse ways humans benefit from the environment, but also incorporate the impact of human actions on the natural system. Coupled natural– human system modeling through explicit modeling of both natural and human behavior can help reveal the reciprocal interactions and co-evolution of the natural and human systems. 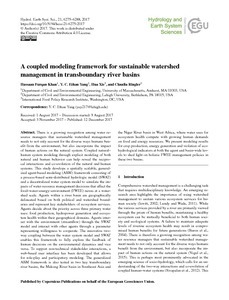 This study develops a spatially scalable, generalized agent-based modeling (ABM) framework consisting of a process-based semi-distributed hydrologic model (SWAT) and a decentralized water system model to simulate the impacts of water resource management decisions that affect the food–water–energy–environment (FWEE) nexus at a watershed scale. Agents within a river basin are geographically delineated based on both political and watershed boundaries and represent key stakeholders of ecosystem services. Agents decide about the priority across three primary water uses: food production, hydropower generation and ecosystem health within their geographical domains. Agents interact with the environment (streamflow) through the SWAT model and interact with other agents through a parameter representing willingness to cooperate. The innovative twoway coupling between the water system model and SWAT enables this framework to fully explore the feedback of human decisions on the environmental dynamics and vice versa. To support non-technical stakeholder interactions, a web-based user interface has been developed that allows for role-play and participatory modeling. The generalized ABM framework is also tested in two key transboundary river basins, the Mekong River basin in Southeast Asia and the Niger River basin in West Africa, where water uses for ecosystem health compete with growing human demands on food and energy resources. We present modeling results for crop production, energy generation and violation of ecohydrological indicators at both the agent and basin-wide levels to shed light on holistic FWEE management policies in these two basins.